PETERBOROUGH – Students at Trent University joined their counterparts from across the province and walked out of their classes on Wednesday at noon to protest against OSAP changes by the Doug Ford Conservative government. Between 150 and 200 students participated in the walkout, which took place in the courtyard in front of the Bata Library. Students made speeches talking about how the OSAP changes will negatively affect them and their educational plans. Some students said that they will be in significant debt without OSAP grants, which the province eliminated. 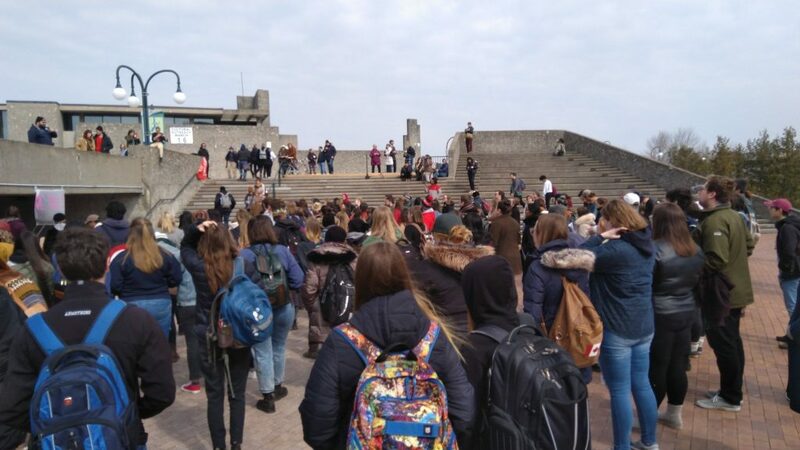 The protesters dispersed peacefully after the students shared their concerns. Organizers said that they were happy with the number of students who showed up. The provincewide protest of college and university students comes about two months after the Ford government announced changes to OSAP, saying they were needed in an attempt to trim the province’s multibillion-dollar deficit. The walkout was organized by the Canadian Federation of Students. The federation is demanding that the provincial government provide more student grants, increase funding for public education and even eliminate tuition fees for all students. “It’s no secret that Doug Ford’s plans spell disaster for Ontario post-secondary education,” the federation posted on its Facebook page for the event. There was no walkout by students at Loyalist College.